The Herbig-Haro object 30 (HH30) is located in the L1551 dark cloud, at a distance of about 140 parsec, in the Taurus star-forming region. 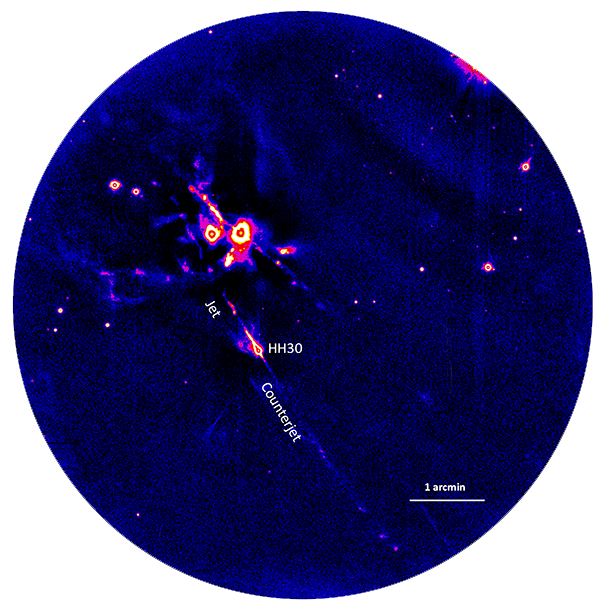 HH30 is considered a prototypical jet-disk system driven by a young stellar object (YSO). The impressive jet/counterjet structure extends several arcminutes in both directions from the exciting source, and shows an undulating morphology in the narrow-band [SII] images. The driving source of HH30 remains optically invisible, highly extinguished by an edge-on disk, which extends up to a radius of about 250 AU perpendiculary to the jet, as shown in the HST images. 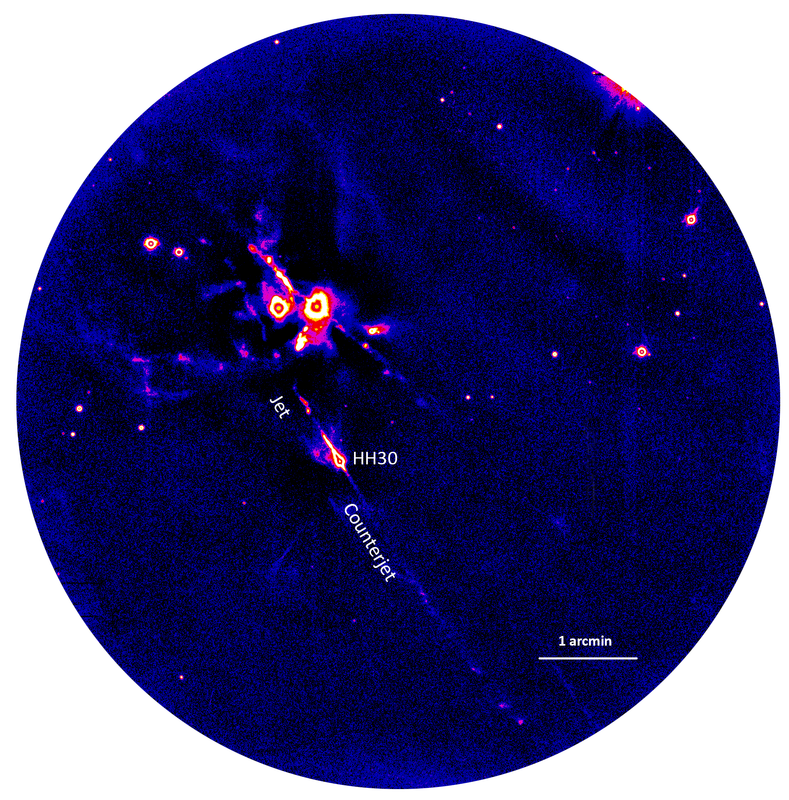 In previous work (Anglada et al., 2007) astronomers were able to fit the wiggling morphology of the HH30 jet using a model in which the driving source of the HH30 jet/counterjet forms part of a low-mass binary system. This work is based on the proper motions of the jet knots derived from two narrow-band [SII] images, obtained at the NOT with ALFOSC, with a time span of 1 year. The jet-wiggling pattern is consistent with either by (1) the orbital motion of the jet source or (2) precession of the jet axis because of tidal interaction with a companion star. It would be possible to discriminate between these two scenarios if the symmetry of the full jet/counterjet system could be analysed: in case of the wiggling produced by orbital motion, a mirror ("C" shape) symmetry with respect to the equatorial plane is expected, while in the case of precession, a point symmetry ("S" shape) with respect to the position of the driving source is expected to be found. Unfortunately, the counterjet of HH30 is much more weaker than the jet, and the NOT/ALFOSC images only covered a couple of knots (the brightest knots, the closest to the source), and did not allow discrimination between the two alternative scenarios. 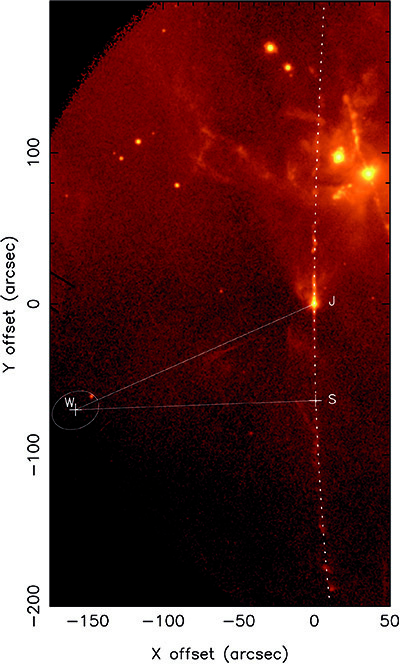 The astronomers therefore obtained a deep image of the HH30 field through a narrow-band [SII] filter using ACAM at the William Herschel Telescope, which provides a wider field of view of 8 arcmin (see Figure 1), from which they were able to better determine the position and the proper motion of the HH30 jet/counterjet system, and found that the undulating pattern is a consequence of the orbital motion of a low-mass YSO binary system of approximately 0.5 solar masses (Estalella et al., 2012). Precession, if present at all, is of secondary importance in shaping the jet. Figure 1. Image obtained with ACAM at the WHT through the narrow-band [SII] filter (λc=6727Å, FWHM=50Å) showing the HH30 jet/counterjet system at a position angle of 30°. The XZ/HL Tauri system is also shown to the west of HH30. The total exposure time of the image is 12000 seconds [ PNG ]. The derived orbital period is 114±2 years, the mass ratio, 2:1, and the binary separation, 18±0.6 AU. Interestingly, this separation coincides with the value required to account for the size of an inner hole observed at millimeter wavelengths, in the CO and dust emission, in the disk associated with HH30. This hole has been attributed to tidal truncation in a binary system. Thus, contrary to what was initially thought, the disk observed in the HST images appears to be a circumbinary disk rather than a circumstellar disk, and is unlikely to have a relevant role in the jet collimation. The large-scale bending of the jet/counterjet can be produced by an isotropic stellar wind from a nearby T Tauri star (see Figure 2). Figure 2. Close-up of Figure 1 showing the large-scale bending of the HH30 jet/counterjer system by an isotropic stellar wind. The dotted line shows the best fit model. The positions of HH30 (J), the wind source (W) and the stagnation point (S) are indicated [ JPG ]. Anglada, López, Estalella et al.,2007, AJ, 133, 2799. Estalella, López, Anglada et al., 2012, AJ, 144, 61.